When twelve-year-old Josh finds he is too small to go on a fairground ride, he drops a coin into a magic wish machine and wishes he was bigger. 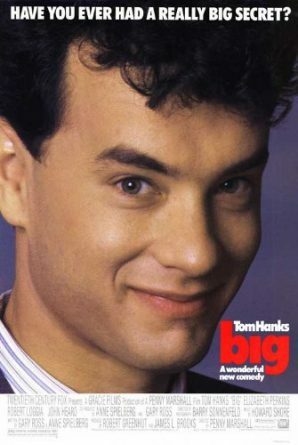 Next morning he wakes up to discover his wish has come true (sort of) – while he’s still boyish Josh inside, his body is that of a grown man (Hanks). 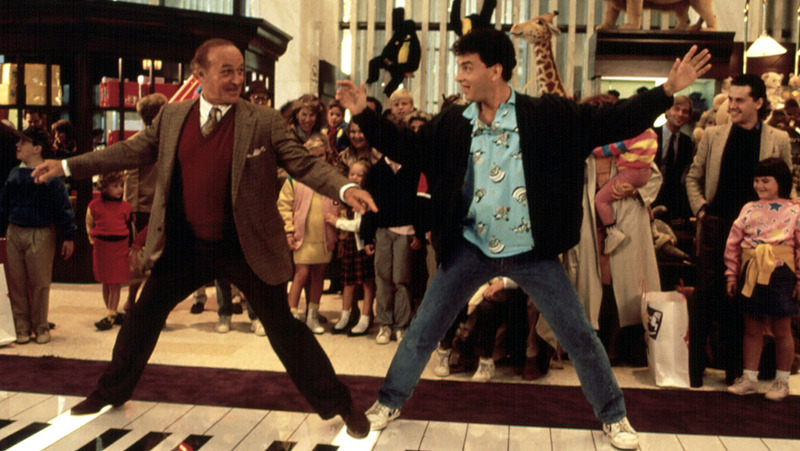 Of course, when his mother (Mercedes Ruehl) sees him, she screams, thinking this stranger has abducted her boy, so Josh heads to the big city and even gets a job, testing toys for a big company run by kindly MacMillan (Robert Loggia). It’s hard to imagine now, but Harrison Ford and Robert De Niro were both considered for the lead role in this adorable comedy before Hanks was hired. He’s perfect as the boy in a thirty-year-old’s body, and brilliantly shows how a young kid would experience things in a man’s world – from his first crush and ‘sleepover’ with co-worker Susan (Perkins) to his first taste of yucky caviar. With Jared Rushton as Josh’s street-smart pal and John Heard as a suspicious work rival rounding out the cast, this is a terrifically played, funny, heart-warming and even weepy slice of family entertainment. None, although younger children may find the fairground wishing machine a bit creepy.